This eggplant is often use in many Thai dishes, either in Curry or spicy Stir-Fry with meat or joining the assorted fresh vegetables. They come in different colors, some a bit pale green and some darker shade of green. The important is the taste. 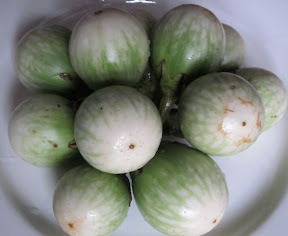 The Thai eggplant taste a bit sweet when eaten fresh. Some that taste a bit bitter we call bitter Eggplant. When I get them, I will post later. 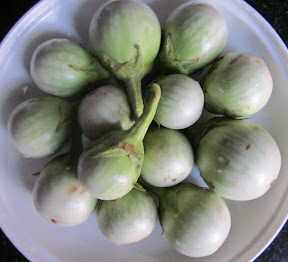 This is the eggplant we add in Green Curry. Sometimes I steamed them with the fish, so that I could have them cook as well. My father loves to eat them fresh with the Chili Sauce I made. It is the vegetable we always have readily in the fridge in my home.